Lifesource Yoga Weekend Warriors for All Ages! Children of all ages will love “Weekend Warriors”, the third of the Lifesource Yoga Summer Series For Children. “Weekend Warriors” will meet on Saturday, August 6 & Saturday, August 13, and both sessions will run from 9:30 a.m. through noon. These sessions will focus on developing strength and flexibility of mind and body through yoga practice and group work in visual art exercises. 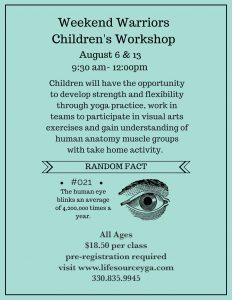 Our focus will be on human anatomy (muscles and bones; child appropriate, of course) and will include a take-home activity. Cost is $18.50 per session and advance registration is encouraged.